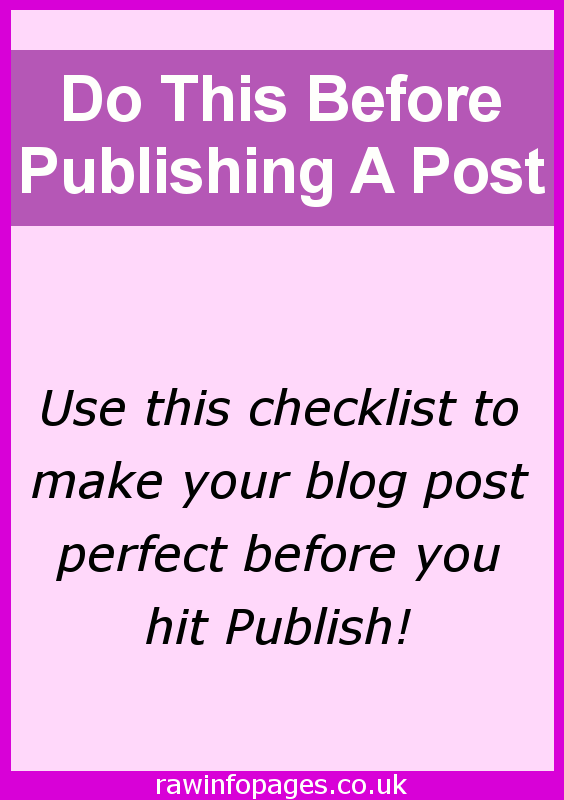 When writing a post for a blog or website, there are essential tasks you must perform before hitting the WordPress Publish button to make sure it will be a success. Use this checklist. Titles should be around 60 characters and should be descriptive and contain keywords that people might search for at Google, Bing, DuckDuckGo and other search engines. It is hard to do in 60 characters, so spend some time experimenting. Why 60 characters? Search results and social shares chop the end off titles that are longer. If long titles are needed, place all the important words in the first 60 characters so they are visible. An internal link is one that goes to another page on your website and it is a useful way to keep people on your site longer. It must be relevant of course, and you should link to a page that contains information that is related to the current page. Instead of visitors viewing one page and leaving, you might find some will to view two, three or more, and this helps your bounce rate. This is a tricky one because an external link sends people away from your site and you don’t want that. On the other hand, linking to an authority site can boost the authority of your own site. Avoid sending people to direct competitors for obvious reasons, but include links to news, information and reference sites. Wikipedia is one example and if you are writing a travel article you could link to a page on Wikipedia that has the history of the city you are visiting or even just a historic building in it that you mention. It is not a competitor to your travel blog, but it provides the reader with additional information that might be useful to them. You obviously need to join some affiliate schemes for this to work, but there are many to choose from. Some people have success with Amazon and one good thing about the company is the wide range of products it sells. Whatever you write about, you could probably find a product on Amazon that is related. Go to Amazon and type in any word you can think of and I’d bet there is a related product for sale. I went there and typed ‘elephant’ just for fun and you know what? There were 200,000 products containing the word ‘elephant’ or related to ‘elephant’. 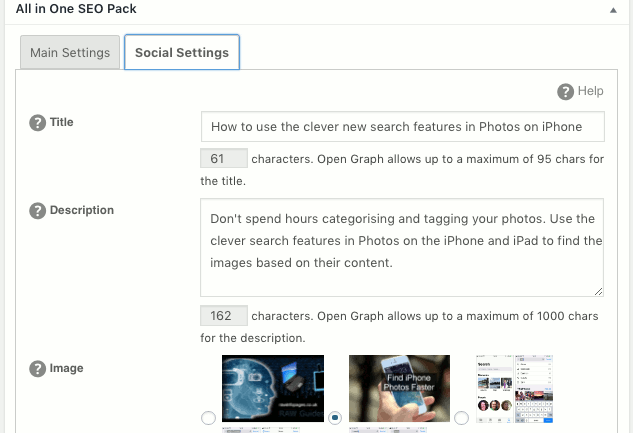 Categories and tags are used to help people find articles on your site. Categories are broad and on a food website for example, you might have four categories, such as Breakfast, Lunch, Dinner and Snacks. Everything we eat can be placed into one of these four categories. Keep the number of categories small. Tags are more specific and there can be more of them. They are used in a similar way to the index at the back of a reference or school book and list all the pages with that tag. Assign the article to an existing category and add tags in the sidebar on the right. Make new ones only if absolutely necessary and keep them to a minimum. Many categories and tags with only one or two pages in are bad for SEO, but a small number of categories and tags with lots of pages is good for SEO. You must have an SEO plugin and the two most popular are Yoast and All-in-One SEO but there are many others. 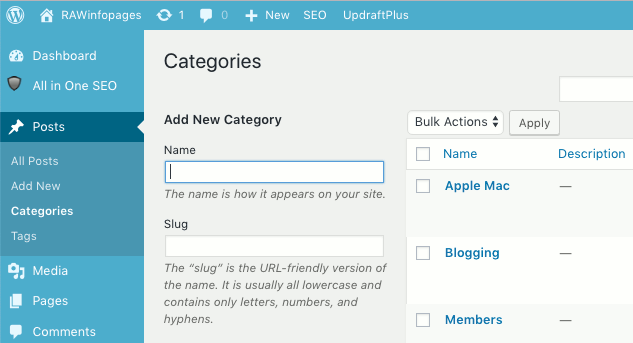 They add a form at the bottom of the WordPress post editor that enables you to hide a description of the page in the page. Visitors cannot see it, but search engines use it to work out what your page is about and when using social shares. Make sure the page has a heading and description in the SEO plugin. 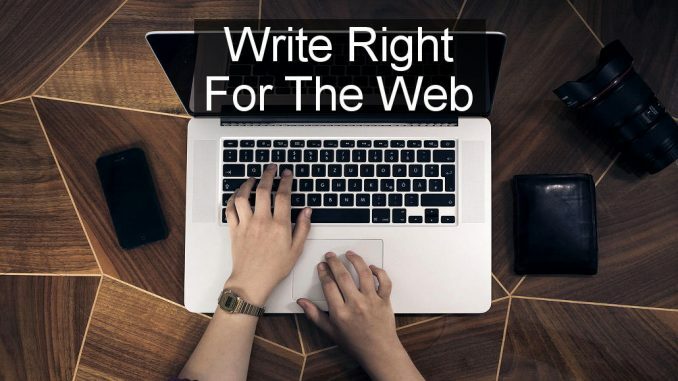 There are rules you must follow, such as getting the length right and there is more information in How to boost SEO with meta information. Search engines read text easily, but have problems trying to work out what is in a photo. For this reason, you must explain what a photo is about in the Alt Text description. 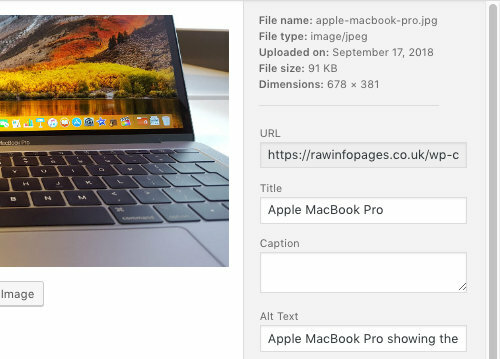 When inserting a photo or afterwards if it is edited, add a short one sentence description in the Alt Text box saying what an image is – a photo of a dog, a strawberry cheesecake, the Empire State Building, or whatever. It helps search engines to understand the page and is good for SEO. It depends on the type of website you have, but usually it is useful to have Pinterest pins either visible in the article or hidden in it. Wikipedia doesn’t for example, but then it isn’t trying to build up a following on Pinterest. Most blogs benefit from Pinterest shares and inserting a visible or hidden image of 600 x 900 pixels is essential. It should look good when shrunk down to a small size. There are countless examples on Pinterest for inspiration. Read Hide Pinterest images in blog posts to see how to insert hidden Pinterest pins in articles. A large image should be included with the article and this could be a Pinterest pin, but it could be something else. Create a large intro image from your own photos ideally, but a free photo library like Pixabay is an alternative, and there are many others. 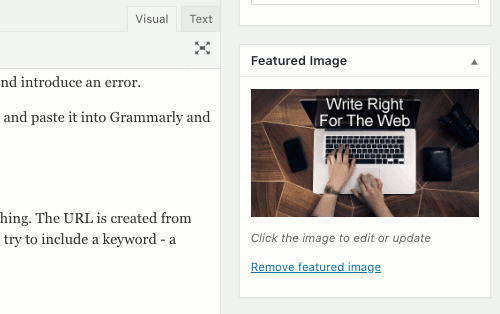 Set the featured image in the WordPress post editor sidebar and in your SEO plugin. When you or someone else shares a link to your post on social media, the featured image is included. Shares look so much better with a great image. It is very easy to make spelling and grammar mistakes because although your English may be perfect, your typing may not. You might miss hit a key when typing fast and a wrong letter is inserted into a word or a letter is missed out. When editing the text, you might also make a mistake and copy, cut and paste a bit too much or too little and introduce an error. Read through the article carefully and look closely for typing and editing slips. Copy the text and paste it into Grammarly and it will analyse it and point out problems. Grammarly can be used to check your writing and there is a free Chrome extension to check your writing everywhere on the web. You should not edit the URL of a page after publishing (unless you are an expert and know the consequences), but it is recommended before publishing. The URL is created from the title, but it might be long and wordy. You might need to shorten it and simplify it. Only use essential words and try to include a keyword – a word associated with the article that people might search for. Thank you for the great practical tips and helpful information. Great checklist of all the necessary things! Thanks for posting this! A spell check is a must Roland. Rocking tips here. I do some of them already. I do need to add more internal links to other blog posts, if they are related. Same with external links. I have done it on occasion but need to make it a regular thing in the future. I usually do include a category but never really thought about tags. I need to add meta descriptions. I don’t add many images. That’s going to change. Image descriptions will be another thing I need to implement. I’m going to start using hidden Pinterest images. I do use a featured image but need to add it to the Yoast SEO plugin.